Retaining walls are incredibly functional and have immense curb appeal. A retaining wall generally holds back soil where there is a large change in elevation. 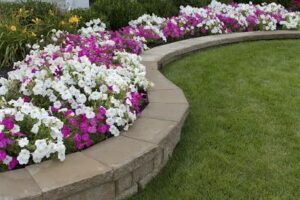 The retaining wall is a type of landscape design feature commonly used to terrace yards which originally had a steep slope. The retaining wall has numerous benefits, such as extending usable outdoor space and controlling erosion. This element of landscape design creates planting beds which bloom in the warmer months, and adds interest to flat or disinteresting yards. If you’re considering adding retaining walls to your property, here is everything you need to know. What Are The Parts Of The Retaining Wall? The Base: A retaining wall must be built on a sturdy base. Without a solid base, you will most likely have to have the entire structure rebuilt. The base of a retaining wall should be set below ground level. In fact, the taller an overall wall is, the lower its base must be set. A solid base is made of compacted soil as well as a layer of compacted sand and gravel which should measure a minimum of 6 inches. The Backfill: The backfill is the dirt behind the wall, which must be properly compacted. In order to ensure drainage, at least a foot of gravel or a similar aggregate should be placed behind the wall. If you intend to do landscaping behind the wall, top the gravel off with at least 6 inches of native soil. Drainage: Since water cannot pass through a retaining wall, it is necessary to build drainage into it to avoid water damage. This can be accomplished with a gravel backfill, built in pipes, or installing weep holes. Height: The height of a retaining wall determines the load it can handle without breaking and how much extra reinforcement will be required. When applied to residential landscape design, these wall are generally between 3 and 4 feet tall. Higher walls than that generally require expert know how. This entry was posted on Thursday, April 7th, 2016	at 11:59 pm	and is filed under Retaining Walls	. You can follow any responses to this entry through the RSS 2.0	feed. Both comments and pings are currently closed.